There are few honest fight fans that would question Terence Crawford’s claim to the P4P title. Canelo and his supporters would argue this but Crawford and Lomachenko are the front runners in the best boxer category and they trade that mantle with each scintillating performance. 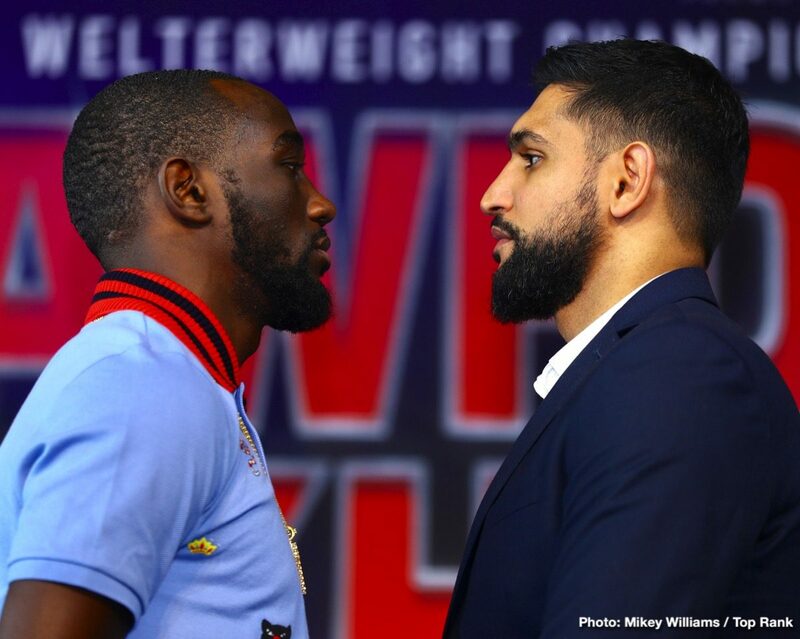 Following Loma’s destruction of Anthony Crolla, Crawford will have his moment in the P4P spotlight when he shares the ring with Britain’s Amir Khan next Saturday night. It’s a fight that many see as foregone conclusion and the boxing world is already looking beyond the bout to potential showdowns between Bud and best of the rest at 147. But history has a habit of teaching us never to write off the underdog and King Khan will be hoping to regain his crown in a venue that has seen more than its fair share of upsets over the years. Come Sunday, we may very well be writing a eulogy to Khan’s roller coaster career. I think it’s fair to say that Amir never fully exploited the potential that was there when he first exploded onto the scene more than a decade ago. Many of you will argue that Khan was never that explosive to begin with, but raw power was never his weakness. I compare him to Tommy Hearns only in their shared flaw…a chin that only a mother could love. I’ve never been a gambling man, but I was sorely tempted to back Breidis Prescott on the morning of his 2008 bout with Khan. The fight was meant to be a stepping stone for Amir but I’d seen the defensive flaw and I wondered what would happen when a real puncher planted a good one. Prescott certainly did that and, if the fight gave us nothing else, the Khan dance became a meme to remember. Unfortunately for the Bolton man, we’ve seen it far too often, but Amir does not come into the Crawford bout empty handed. Trainers rarely get their credit, but Virgil Hunter is a notable institution in boxing. We’re fortunate enough to have lived through the era of Andre Ward, but we didn’t always question how such a fighter was crafted. Hunter was as much a cornerstone of Wards success as was the fighter himself and they shared a Father/Son relationship reminiscent of Tyson and Cus D’Amato. When Hunter was drafted into the Khan camp, many saw it as a fruitless exercise, but Virgil’s defensive mantra was exactly what was called for and Amir’s 2014 shut out of Devon Alexander was a pitch perfect performance in how to accentuate the positive as the song goes. Khan was on top of his game that night and it was obvious that Hunter had identified the flaws we had witnessed in the Danny Garcia debacle. Khan threw fast combinations and moved. His chin may have been suspect but Amir’s tendency to stay in the pocket was always going to end badly against quality opposition and that style was an instinctive weakness that Hunter had to address. Against Alexander, we saw King Khan at his Virgil Hunter best, but that relationship was, very sadly, cut short. Hunters catastrophic heath scare saw him ‘at deaths door’ by his own admission and his biggest fight was fought in the years since. Khan’s corner was taken over by Joe Goossen who declared, rather worryingly, that Amir would adopt a ‘Mexican style’ and, for those who’ve followed his career, this meant that the meme dance was back and, indeed, it was. His last outing against Samuel Vargas was fraught with danger and he staggered to the final bell in a bout that should have been a showcase for yet another comeback. Following such a poor showing, no one would have given Khan a credible chance of ever challenging for a title again. But the human spirit should never be underestimated, and Virgil Hunter battled back in a way that Amir did not. Virgil had beaten the odds and he stepped back into the fray to, hopefully, right the wrongs in Camp Khan and send the Mexican style home to Tijuana. Hunters return may be too little, too late at this stage. He’s been absent from Khan’s corner for quite some time and the British fighter has slipped back into dangerous territory too many times. But, at one point, Virgil had homed in on a style that really worked for Amir and it remains to be seen if they can replicate that next Saturday night in the biggest bout of the Bolton man’s career. When asked this week how Khan could beat Crawford, Hunter simply said “Luck and Prayer” and that honesty is welcomed in a sport awash with arrogance. Should Crawford put in another P4P performance and hit the showers early, it will come as no surprise but, if the underdog comes good, it would a testament to both the tenacity of Virgil Hunter and the resolute self-belief of Amir Khan.